Vacker UAE is the best supplier of Humidifiers and Dehumidifiers in UAE. We have been providing our services for the past ten years and the number of clients retaking our services or repurchasing our products is very high, which shows the trust of the clients in our company. People from different cities have benefited from our services such as Abu Dhabi, Ajman, Dubai, Fujairah, Ras al-Khaimah, Sharjah and Umm al-Quwain. Vacker UAE supplies Cold Room Dehumidifier in these regions. Cold rooms and stores generally have high humidity problems which lead onto other different problems. Typical cold rooms and stores generally have a centralized refrigeration system but in a very low temperature condition, a refrigeration system alone is not capable of controlling the humidity level within the room. Hence, it requires a proper Desiccant Dehumidifier for controlling of the humidity level of the room. Vacker UAE supplies different models of cold room dehumidifier, both small and large and stores according to the requirements. Generally, high humidity in the cold room and stores is the result of frequent opening and closing of their doors. The warm and humid air from the outer environment enters the room due to frequent opening and closing of the door which increases the humidity of the room. Our dehumidifiers can be installed in the room or outside the room according to the desire of the customer. The operational capability of our dehumidifiers remains unaffected by the surrounding air. 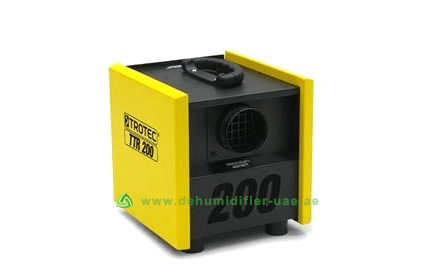 Vacker UAE has excelled in providing the right kind of dehumidifier for cold room and stores. The dehumidifiers can easily be maintained and adjusted easily according to the requirement. With such high quality dehumidifiers you can sit back and relax without worrying about the humidity level in your cold rooms and stores. It just has a weight of only 19 kg making it very easy to carry. It possesses the capacity of 1.1kg/h. It is the ideal type of dehumidifier for the cold room as it can operate in the temperature as low as -20 degree Celsius. It also can perform in temperature as high as 35 degree Celsius. It can operate in the humidity level ranging from 0 degree Celsius to 100 degree Celsius. It is very easy to handle, maintain and perform cleaning hence is very user friendly. It has a weight of 45 kg. It can effectively perform its operation in temperature as low as -25 degree Celsius and as high as 35 degree Celsius. It can operate effectively irrespective of the humidity level of the cold room.